A great use for boiled eggs that people don’t always think of is salad dressing. I often put boiled eggs in my salad, but the other day I realized they’re and ingredient in thousand island dressing, and decided I needed to try making my own. 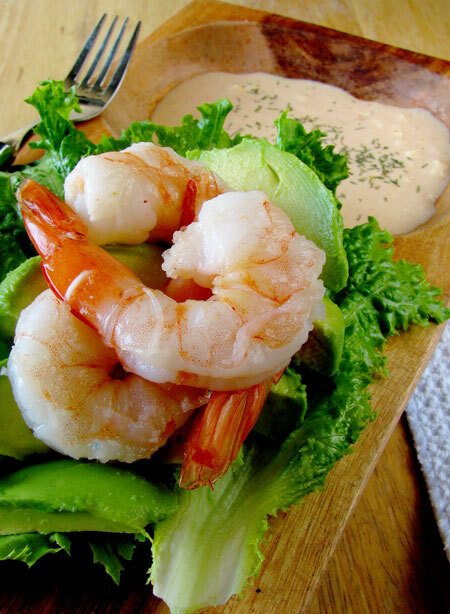 This dressing is tangy and rich, and goes amazingly with avocado and shrimp. The history of the salad dressing is rather interesting. It’s named for the Thousand Islands area of upstate New York where it was served at dinner parties run by fishing guide George LaLonde Jr. One night actress May Irwin and her husband were having dinner after their fishing trip. May was apparently also a renowned cook and cookbook author and was very impressed with the dressing. She asked George’s wife Sophia for the recipe, and gave it the name 1000 Island Dressing. She passed it along to George C. Boldt, who owned the Waldorf Astoria Hotel in New York, and the Bellview Stratford in Philadelphia. He had his world famous maitre d’ Oscar Tschirky put the dressing on the menu immediately, and so its fame began! This is my own version of thousand island salad dressing. Usually pickle relish is used, but I didn’t have any, so I used pickle juice from a jar in my fridge. I also like that because I don’t want the dressing too chunky. Between the pickle juice and grating the onion, the only chunks are the boiled eggs. I love this dressing mainly because I almost always have the ingredients on hand. Mix mayonnaise, ketchup and pickle juice in a large bowl. Peel the egg and chop finely. Mix into the dressing. 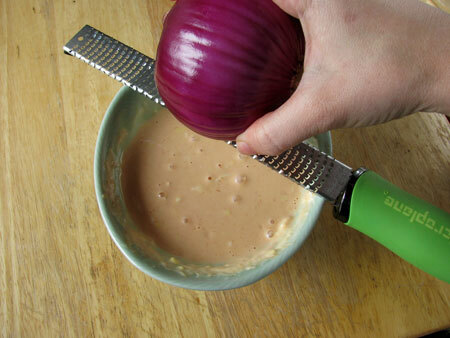 Grate the onion into the bowl with a microplane grater (you can eyeball the amount). Use a spatula to scoop the dressing into a blender. Give it a whirl until eggs are finely chopped and dressing is well mixed. Store in a jar or bottle. Optional: If serving in a bowl with the salad, sprinkle with dried dill. 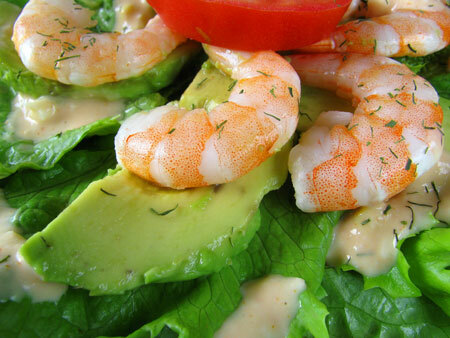 Approximate cost/serving: It comes out to about $1.50 to make the dressing. It can make 7-8 salads so that’s only 19 cents a serving. Vegetarian/Gluten free: There are eggs of course, but no meat. For gluten free make sure to read labels on your ketchup and mayonnaise to get gluten free brands. I make it with Heinz chili sauce instead of ketchup, bread and butter pickle juice, and a few drops of Worcestershire sauce and a drop or two of hot pepper sauce. I haven’t done the onion or egg, but I might try them. Thanks for the pretty pictures! Thank you so much for sharing the history. 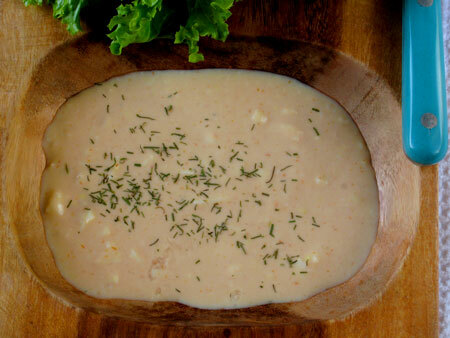 My grandmother served 1000 Island dressing in her restaurant when I was a child. She told me the name came from all the little chunks in the dressing. She made her’s with Campbell’s Tomato Soup. I think I want to try this omitting the vinegar containing products and use Fage Total yogurt. I’ll use tomato paste concentrate for the “pink” and Bubbies Pickle Relish for that aspect as it is packed in Brine, not vinegar. I will probably bump up the hard boiled eggs to at least two and what a great idea to use the microplane on the onion! If it needs it I will add a touch of Agave (yes I know it’s bad but it’s what I have on hand.) and perhaps some lemon or lime juice. Sweet sweet memories! No agave or citrus juice required. Only the Fage yoghurt, Bubbies pickle relish, chopped hard cooked eggs, and microplaned onion with just enough double concentrated tomato paste (from a tube) to get the pink and of course sea salt. It was wonderful! What a lovely blog you have and your about me page is awesome!!! 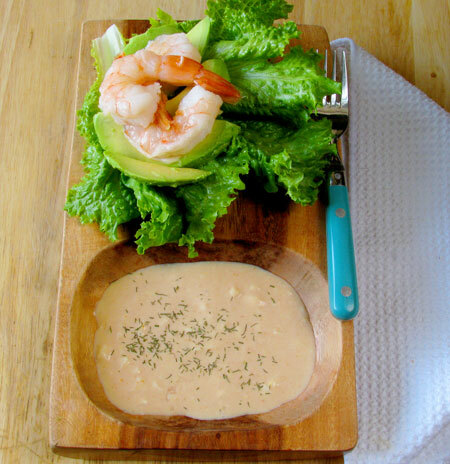 I stumbled upon your blog while in search of the history for Thousand Island Dressing. Not only is your version mighty tempting, the side of history is just what I needed. Thanks so much for sharing…Bookmarked!! !